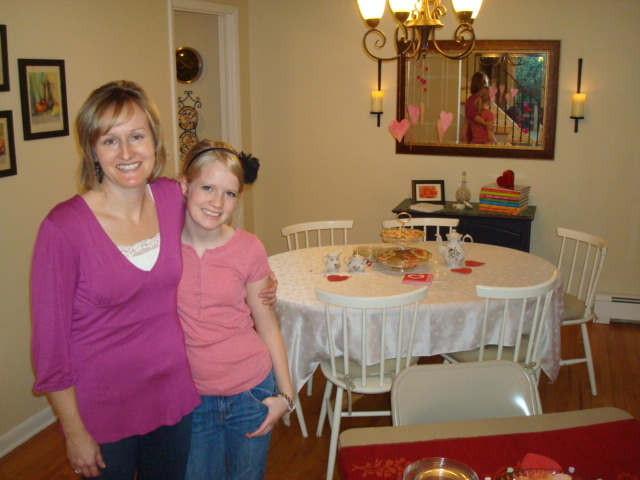 Last Saturday Anna and I hosted a Mother-Daughter Valentine Tea in our home for faculty wives and their daughters. And since everyone likes a party, we had quite a crowd of moms along with daughters, ranging in age from 2 to 12. The idea for a party was Anna’s. She wanted to plan something back in the fall, but life felt too full then. With Valentine’s Day approaching, it seemed like the perfect time to organize a party. I told Anna from the beginning that if we did this, she had to help. She was emphatic in telling me, “Mom, I will do everything.” She did do a lot, but not everything. It was a team approach. In theory, I love the idea of sending real invitations or making them. In reality, Evite is a really nice option. Anna and I spent one evening looking at the Valentine-related invitations on the website, and finally decided on one we liked. We had the invitations, the date, the time, and now all we needed was to figure out what to serve. I wanted to keep things as simple as possible and not serve anything that required a utensil. I also didn’t want to serve a ton of options as someone (me!) would either need to make all those options or buy them. In the end, we made heart-shaped sugar cookies and decorated them and made oatmeal scotchies. If you don’t know what an oatmeal scotchie is, let me introduce you. It is a humble cookie in many regards. This is the kind of cookie whose recipe can be found on the carton of your oatmeal container—it is not a gourmet cookie. Mix together some flour, oats, sugar, baking soda, butter, eggs, and vanilla. Add butterscotch chips and drop onto a cookie sheet and voila, you have oatmeal scotchies. Guess which cookies were devoured by both the moms and the daughters? Yes, the oatmeal scotchie! We also served some fruit and of course, tea as well as cherry limeade for the non-tea-drinkers. Jacquelyn, you would be proud as we used real tea cups (along with the assorted coffee mug) and plates rather than paper products. I did have a pile of dirty dishes, but it was worth it. Everyone had a good time and thanked us for hosting a party. One mom of a young daughter said, “We have been looking forward to this all day.” I’m glad our little party brightened someone’s day.